Pryce “Mother’s Day” Tribute | What a Beautiful Mess! Mum has never talked much about herself, but over time I’ve picked up tidbits about what her life was like when she was young. She was 17 years old in 1958, which is the year I based this picture on. She’s talked of life on the farm, working with my Granddad doing what most sons, not daughters, at that time did. We talked a bit about that time of her life a few days ago and she mentioned doing field work with Granddad and working with the cows, she had ducks and loved the cats. She had a little building out in the yard to spend the summer nights in alone, reading and listening to her transistor radio. She had already left school by the time she was 17 but she was in the generation of the one room school house and the only means of transport to get there was either your feet or a horse. Luckily there were horses for her and her siblings to use to get there, but it had to have been terribly cold through the winter. Her and her Dad were close, and when I think about them both I can see myself in them. The love and connection to the land has always been first and foremost to life here, for each generation that’s lived and worked here. I recently told her about my life in the virtual world and she took it in stride, but she was curious. I described it as being a lot like playing with dolls. When I got some pictures done I showed her a couple of my favourites and let her choose the one she liked best, she identified the one on the right, saying, ‘You have the lost look that I think I had a lot back then’. To which I found quite sad, it’s always odd to think of a parent as a person with a life before the kids or as a kid themselves, but imagining Mum at this age and knowing she felt lost and maybe alone is haunting. The passing of time ensures we all age, and I make a point to appreciate the time I have with Mum and Dad. I always want her to know that, ‘I love you, Mum!’. And as for my outfit? 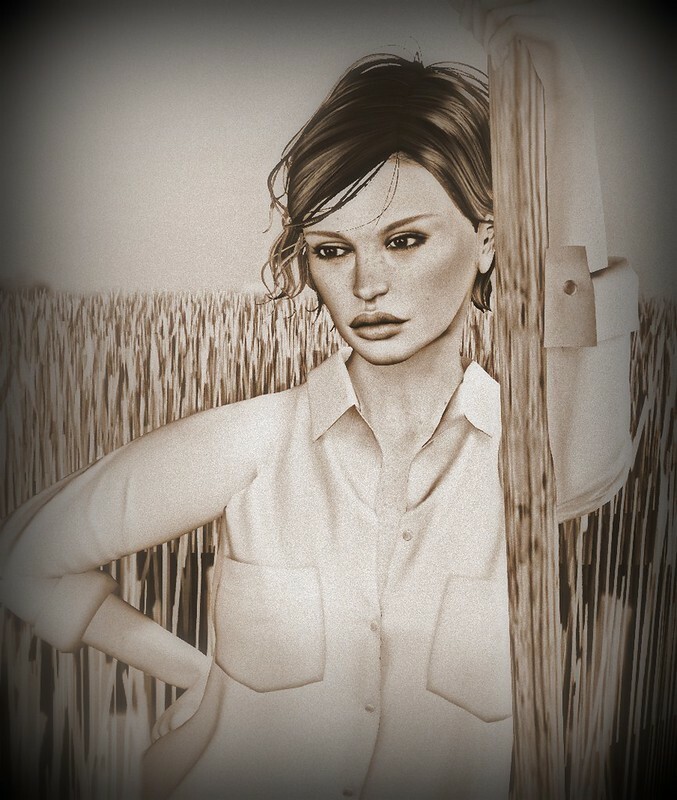 Mum described what she would wear back then and let me tell you, finding a ‘basic blouse’ in SL is not easy! But I found the ‘Sawyer Top’ in neutral at neve, and she said ‘it’s perfect’! The ‘S06’ hair is from barberyumyum. The ‘Maddie’ skin in ‘honey’ tone is from The Skinnery on the ‘Lilo’ bento head from Catwa and the ‘Lara’ mesh body from Maitreya. I was at The Far Away for this picture.